Ever end up with a little jam left? 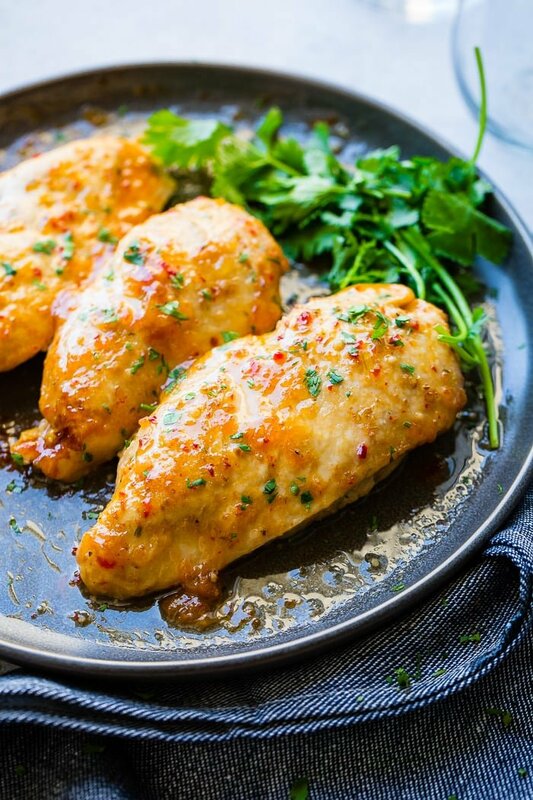 Did you know it makes for the perfect sauce on chicken? Bottom of the Jar Chicken is a quick and easy chicken recipe! Let’s chat about bottom of the jar chicken! 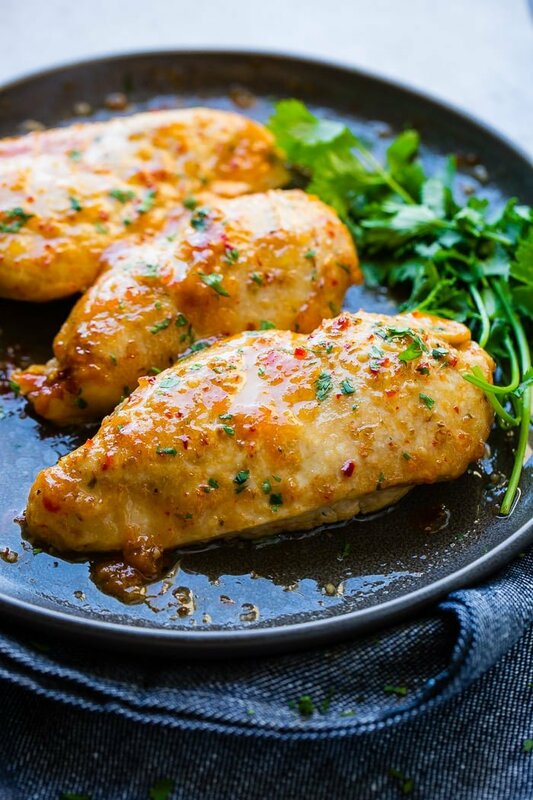 A simple chicken breast recipe doesn’t always turn out very flavorful and that’s kind of annoying because every adult out there knows that what we really need is quick and easy AND delicious dinner ideas, which is where this Bottom of the Jar Chicken recipe comes in. 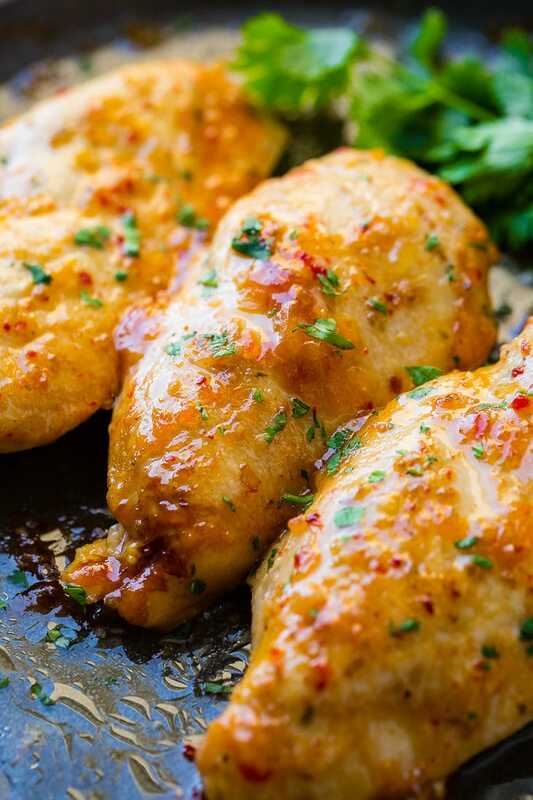 We start with a simple breast of chicken and then just three more ingredients, apricot jam, Italian dressing (here’s a recipe for a homemade version of Italian Dressing we LOVE if you prefer), and garlic powder to add a stitch more flavor. 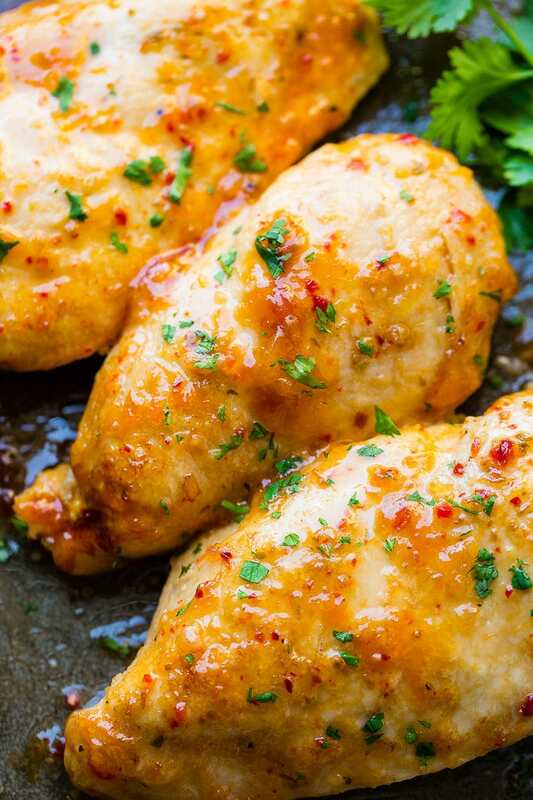 As everything bakes in the oven the marinade seeps into the chicken making it packed full of flavor and a perfect stand alone dish, served over pasta or even shredded on top of salad. A long time ago I heard someone mention that they had made Rachel Ray’s bottom of the jar chicken. I asked what it was and they responded that you use the last of your jam and fill the jar with salad dressing and herbs or something like that and then cook it over chicken. I think that’s what she said at least. Anyway, the other night I noticed that we still had a little of the pineapple apricot preserves from the turkey burgers we had made. I knew it wasn’t enough for more turkey burgers, but I actually don’t really like that jam for toast so I needed to think up something to do with it. I suddenly remembered that girl talking about using it for chicken, so I winged it! From there we’ve been creating this Bottom of the Jar Chicken ever since, though 9/10 I just buy regular ol’ Apricot preserves. Here’s the best part too. This makes a killer freezer meal. Just whisk up the marinade in a freezer bag, add chicken breasts or chicken tenderloins, seal and freeze for up to 1 month! There are a lot of store bought dressings that you can actually use as a marinade for chicken. We mention some in our Asian Ginger Marinade for Grilled Chicken recipe. Italian dressing is a great go-to that anyone can use for chicken, but it’s especially good if you add your own fresh herbs, sun dried tomatoes or even, like in this case, jam. We’ve found that strawberry and raspberry are often too seedy and sweet. However, I’m not stopping you if you’d like to try! 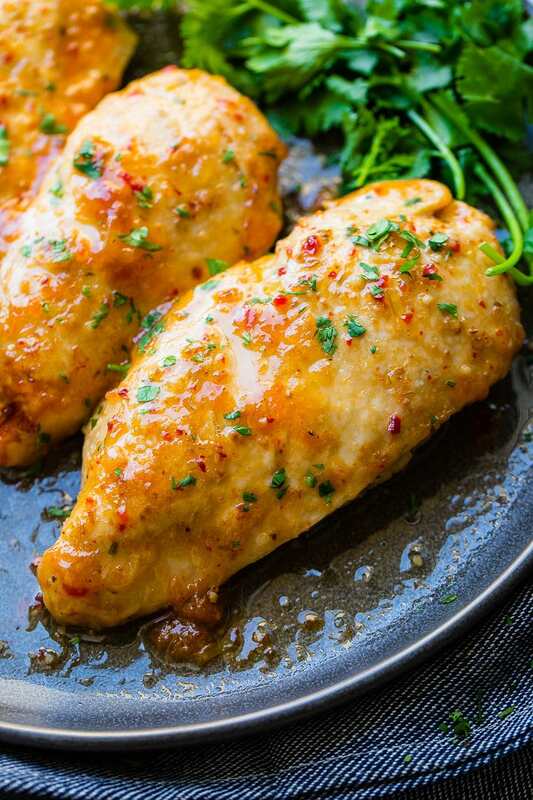 Chicken breasts are generally baked at 350 for 25-30 minutes, depending on the size. To make bottom of the jar chicken in the slow cooker or crockpot you need to use chicken breasts or an increased number of chicken tenders or there won’t be enough meat in the slow cooker and it will burn. Place the crockpot on low heat and add the chicken breasts. Pour the dressing all over the chicken and place the lid on. Or if you’re using high heat only cook the chicken for 3-4 hours. The instant pot is a great shortcut to making this chicken. Place a little dressing in the bottom of the pot then add the chicken and the remaining dressing. Set the instant pot to high pressure and close the lid, making sure the pressure gauge is set to seal. Cook for 10-15 minutes and allow a 5 minute natural release. Remove the chicken and enjoy. This chicken was fantastic. It was light and incredibly flavorful. You can’t tell in the picture, but there was actually plenty of sauce which is huge for me. I’m a saucy person 😉 I loved the mild and slight tang from the dressing with the fruity preserves. It was honestly so good! As I type this I’m totally craving it! I say play with the flavor. Add the amounts I did and then taste test to make sure it’s to your liking. Looking for more marinade recipes? 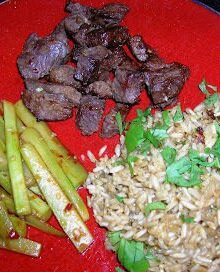 A good marinade is one of my favorite things, so make sure you try our Balsamic Steak Marinade, Favorite Steak Marinade, Sticky Asian Grilled Chicken or Grilled Hawaiian Chicken! Or if you’re just looking for another delicious chicken dinner, go with this Creamy Garlic Chicken! You will love it! Mix the salad dressing and preserves together and pour over the chicken in a small baking dish. Bake at 350 for 25 -30 min. Serve chicken and sauce over pasta! Any idea on weight of chicken? Some chicken breasts are quite large…. I would say about 20 ounces of chicken or about a pound and a half. grape). Lol. I also added a few crushed pepper flakes. So I’ll see how this turns out. Yum! We love it with strawberry! We would love to hear how it went! The chicken looks wonderful! Honestly, I’ve never heard of this ‘strange’ recipe before 😂 but I can see this is amazing with all your experiments 😍Apricot absolutely will bring to the chicken a great taste! I cannot wait to try this!! Thanks Natalie! You are going to love it! I am sure of it! Orange marmalade works wonderously on chicken as well. Little but of soy sauce and garlic.. oh man it’s yummy. I love the sound of that! I’ll have to try that ASAP! I love the name of this recipe and it’s so versatile too… I can use any jam or preserves I like! Thanks Abeer! It really is so good! My family loves trying new chicken recipes! This looks amazing! Is that calorie count correct? No, we are working on getting it corrected. Thank you, Shawna! I have never heard of this! Can’t wait to try it! It is so dang good! You’re going to love it! With school starting, I’ve been looking for more freezer meals. This one is perfect! Such a good idea and it looks so good!! What a great way to use up last little ends of things! Right?! I always feel extra awesome when I clean something out of the fridge that has been in there a while! Ha! What do you think about using fig jam? I bet it would be delicious!! If you make it, let us know how it turns out! thanks for asking! Sounds delicious! I was shocked at the nutrition info then realized it was for the whole recipe! Eek! I’m curious about the calorie count. I know it is approximate but 3278 seams like a lot. Is that correct? 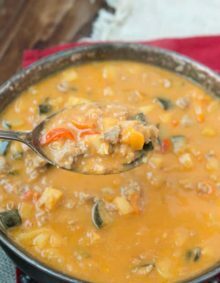 Love the blog and your recipes! I just posted similar. It says it’s for the whole recipe. Still seems like. Lot for 2 chicken breasts. That is way too high! I will check on it. Thank you for leaving a comment! I love this idea Carrian! All too often I find those dribs and drabs of preserves or jam-if I use it on a sandwich then there won’t be enough for another one but too much for this sandwich…this recipe solves that problem lickety split1 I love that you can do it it a slow cooker or pressure cooker too. In the hot summer weather, those last 2 appliances have been my friend for sure. We just love this chicken and it’s an extra bonus that it uses that extra jam!! If you make it, we would love to hear what you think! You say up to 2/3 bottle of Italian Salad dressing, but not what size the bottle is? Not sure whether to buy an 8 oz bottle or 16 oz. I’m anxious to try this. Thank you! Grandma Honey, I was wondering the same thing 🙂 Possibly it means 2/3 Cup of the Italian Dressing? 16 oz bottle! Great question! How kind of you to get back to me. You too Elizabeth!! I’m in your camp on RR too. She has good ideas but you always have to improvise on it. This looks so great to me. I love your blog. Great idea! Thanks for posting! haha i sure do! plus i love that you said “valuable real estate”. i've never heard that but i'll for sure be stealing it!!!!!! 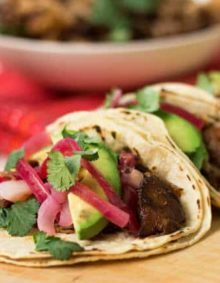 Don't you just love it when a recipe comes together like this and you get to use something that's been taking up valuable real estate in your fridge? Yumm!